Mio Technology Europe has launched four new portable satnav devices. 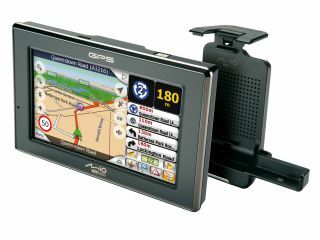 The Mio C320, C320t, C520 and C520t all come with a 10.9cm widescreen display, Tele Atlas route mapping and Traffic Message Channel (TMC) reports. The four also include speed camera warnings out of the box, the company says. Each Mio satnav has a split-screen display. This enables you to see route directions in one half of the screen, and information about your journey in the other. Information includes time and distance to destination, next four manoeuvres, traffic congestion information and selected Points of Interest (POI). The speed camera alerts are free for the first year, Mio says. You can also add your own speed camera locations and share them with others via the Mio website. The C320t will be supplied with a TMC-enabled version of the cradle (available as accessory for the C320).